As American researchers have documented, in their country the “food miles” segment (from producer to retailer) contributes only about 4 percent of total emissions related to what Americans take home in their grocery bags, while 83 percent of households’ carbon dioxide footprint for food consumption can be traced back to the production stages. Since “food miles” aren’t traversed in a vacuum, other environmental factors have to be taken into consideration when making dietary decisions. Unsurprisingly, certain climates are more suitable for the production of certain foods (fruits, for example). So building a greenhouse where you can grow peaches during winter in New England is less environmentally sound than just transporting those peaches from across the country. I think that would make sense to most locavores. 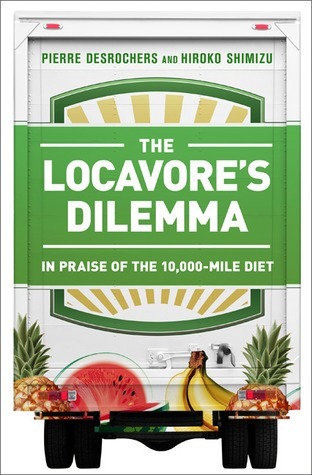 The Locavore’s Dilemma is well-researched and well-written, and I’m glad it exists. Locavorism is one of those ideas that seem to make sense on a gut level, and ideas like that always deserve to be challenged. But I take issue with the book on many fronts, including its understanding of most locavores’ motivation. Desrochers and Shimizu assume people who value eating locally produced food over food that has traveled long distances want to impose their dietary habits on everyone on the planet, at the expense of social and economic logic. Do I think a financially struggling person living in Santa Barbara should attempt to maintain a vegetable garden rather than buy cheap meals at a fast food chain? Yes. Do I think starving families in Haiti should refuse food drops from the U.S. because of the carbon emissions of the planes that delivered them? No. Is it time to stop employing the overused rhetorical device of asking myself questions with obvious answers? Probably. But the most problematic implication of The Locavore’s Dilemma is evident in The Daily Beast’s defense of it. That is the argument that the food production/consumption situation that exists today is better than any imagined alternative simply because it is what exists today. Huge factory farms have beat out small, family-run farms largely due to government subsidies; presumably, by virtue of that economic victory, they are better for the world we live in today. That Panglossian mindset strikes me as a grand excuse to be lazy. For all his faults, Voltaire seems to have had at least one thing right: we don’t live in the best of all possible worlds. So let’s cultivate our garden. Meghan, I appreciate your measured approach. May you live to become a beacon of reason in these bifurcated times. Haven't read the book; just heard about it today listening to NPR. I have always preferred to get what foods I can at a farmers market or farmstand for a few reasons: 1. It may cost the same as at a grocery, but all my money goes to the farmer who grew it, rather than a fraction to the farmer, another to the truckers, and a lot to the retailer. Thus I help keep local farmers in business. I think that is a good thing in the world. 2. The food at the farmers market/farm stand is as fresh as I can get it (other than growing my own). There is nothing so good as a warm, ripe tomato just off the vine, or sweet corn, just picked. If I still ate meat, there is nothing like fish just caught that day. Sure the other stuff is OK, just not as wonderfully good. 3. Food imported from all over the world may not meet our country's standards for safe pesticide use, worker sanitation etc. and we don't have enough inspectors to send all over the world to find out. 4. Who knows what the working conditions are on farms in, say, China. Garlic from China may be just as cheap as locally grown, but it is no better; garlic is not a seasonal food (it is dried for storage after all); it grows in lots of places here, and why should we contribute even more to our imbalance of trade for something no better than what is widely available from here? 4a. What form of government are we supporting by buying food from abroad? Do we care? Maybe we should. Thanks for your blog. I agree--we must all tend our gardens.